Let's write "hello world" in go. But that's no fun, is it? "Give a clever engineer a straightforward problem and they'll add complexity until it's interesting enough to solve." Let's write a program that writes hello.go for us! That's right: write go, using go. The "go/ast" package is used by gofmt and gofix (and various other tools) to parse and manipulate go source code in the form of abstract syntax trees. We're going to build a new go program from scratch, in go, so we're not really interested in parsing so much as constructing an AST and printing the result as human-readable source code. // The package name is "main"
// This func is named "main"
// And an empty body. Which does compile, but doesn't actually do anything. Let's add the next pieces: The import statement for "fmt" and the fmt.Printf statement that actually prints "Hello world." // With a string literal of "fmt"
// Representing a function call to "fmt"
Try the final product out on play.golang.org here. In conclusion, if you'd like to do some code generation with go, this might not be a bad place to start. You can explore other parts of go/ast by adding some extra function declarations with actual parameter lists, return values and even receiver types, and then calling them from main. Caveat: This currently only works on Safari. It may work on a bleeding edge Chrome dev build but I haven't tried that. This isn't a downsampled down screen shot. 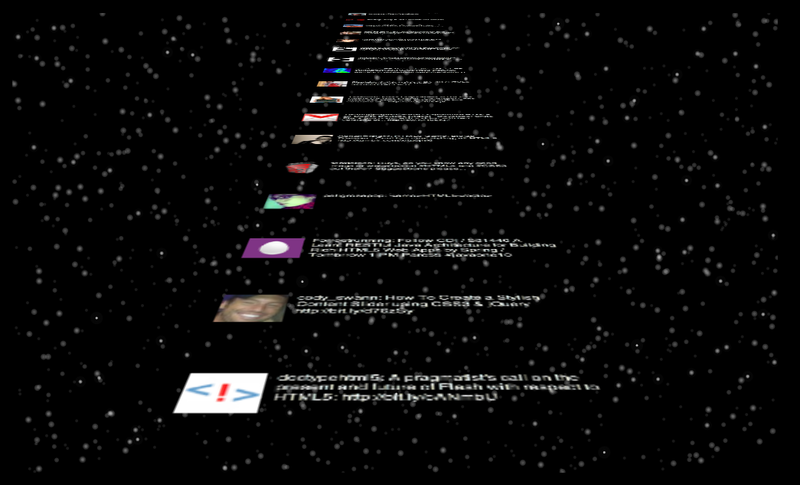 It actually looks like this if you let the rotated div get too large. As you can see, it becomes unreadable after a while. It also starts eating up an increasing amount of CPU: it got to 100% (out of 400%) on my quad core iMac after a few minutes. Not good. So instead of putting all of the tweets into the same rotated div, I rotate each tweet element individually and that seems to fix the problem. Also, I start deleting tweets at the top (where you can no longer see them anyways) after a while, just to keep the dom size down. They are now readable and the CPU is happy. Also, the background is generated dynamically using the Canvas element. I wanted a more realistic looking star field so I did some research on the distribution of star sizes and colors to see if I could perhaps simulate it with a Pareto distribution. Turns out the distribution of star colors and brightness is some other weird distribution so I just made it more or less random, with smaller stars slightly more frequent than larger stars. Functional languages are based on lambda calculus and the CS literature often uses examples where a lambda expression is called simply, "lambda." Note: I haven't tried this in any version of IE but it appears to work in Chrome, Safari and Firefox. Scroll down to "Unicode Hex Input" and make sure that checkbox is checked. Now whenever I want a λ I can just hold down the Option key while I type 03bb and blammo I get a λ. Which by the way is still five key presses but looks way cooler than "lambda" and takes up less space on the screen. I have no idea what you have to do on linux or windows. You're right, this isn't very practical. And setting your encoding from UTF-8 to UTF-16 like, doubles the bytes you have to transmit. But you ARE gzipping all of your http responses aren't you? AREN'T YOU? 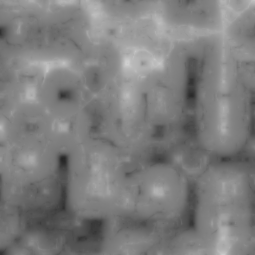 I mentioned in a previous post that I was working on a Perlin noise generator for Art Evolver. 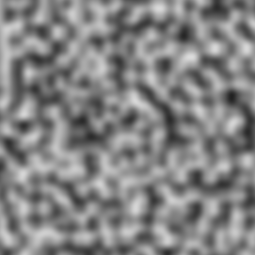 Perlin noise is a function of (x, y) that produces a random-ish pattern. It's not completely random because it has smooth hills and valleys, but the distribution of those hills and valleys is random. A side note about this algorithm: Usually if you're a computer scientist and you come up with a clever algorithm to solve a particular problem, you get an award from a university, or a CS-centric professional organization like the ACM or IEEE. Perlin got an Academy Award for this noise function. As in, the Oscar kind of Academy Award. For an algorithm, something not usually consider artsy. I found that interesting. Note the horizontal and vertical stripes. There's almost an upside down cross in the lower right. SAAAATAAAAN! Rather than try to fix that source code (which the author apparently closureized (making it very difficult to understand)) I kept searching. 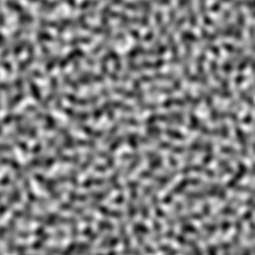 From the main Wikipedia entry on Perlin noise, I ran across a variant called Simplex noise. This is an improvement on the original algorithm, also written by Ken Perlin, in 2001. That Wikipedia page linked to a paper by Stefan Gustavson(pdf) that explains both classical and Simplex Perlin noise in a much easier to grok way than anything I've read by Perlin himself. I highly recommend Gustavson's paper if you found Perlin difficult. I ran some performance comparisons between the classical and Simplex algorithms, and for 2-D I only saw a ~10% improvement with Simplex. Granted, the latter is supposed to be faster in higher dimensions (classical is O(N^2) vs. simplex O(N) where N is the number of dimensions) so it doesn't matter much for my purposes. Subjectively I think I prefer the Simplex noise to classical, so I'll probably go with that for Art Evolver. Again, the source code is here.